I had the pleasure of working on another batch of illustrations for a short story published in Cricket Magazine, titled ‘A Wind Tossed Spell’ by author Maggie Murphy. 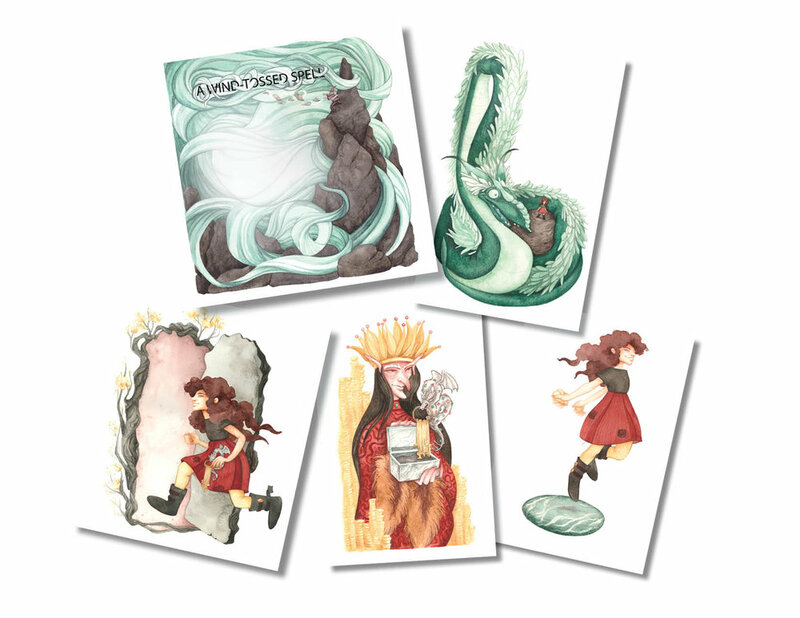 This time around I got to illustrate fairies, sea serpents and all sorts of other magic! Certainly fun to stretch my illustration muscles and venture into new things! "A Wind Tossed Spell" in this month's (Jan 2019) Cricket magazine, you can get a copy for yourself online at Cricket Media. Original art available via my Etsy shop! Back in September I stumbled upon Devon Bragg and Art by Moga’s #fallthisinyourstyle challenge - essentially, it’s a self portrait illustration with everything I love about fall. I’ve been wanting to do a #witchsonia illustration (a illustrated version of myself as a witch) and I thought this was the perfect opportunity to test it out. Autumn is absolutely my most favorite time of the year ~ being someone who has lived in the American southwest her entire life, any indication of a season change is welcome (all we get here is hot and then hotter). MY FAVORITE AUTUMN COMBOS: Changing fall leaves, hot coffee in a thermos, toasted maple-pepper pumpkin seeds, winter coats, homemade scarves, funny hats, layers of clothing, fun tights in a myriad of colors, bunchy socks, BOOTS, pumpkin carving, hot chai tea, wrapped up in a blanket reading books on cold day, apple pie, pecan pie, hot spiced rum in an enamel cup, ravens, pimply gourds AND because all this happens in the Halloween season, I naturally think of myself as some kind of autumn witch floating around making magic with all of my favorite things! Maybe I’m a dork or maybe you’re like me? What are your favorite autumn loves? 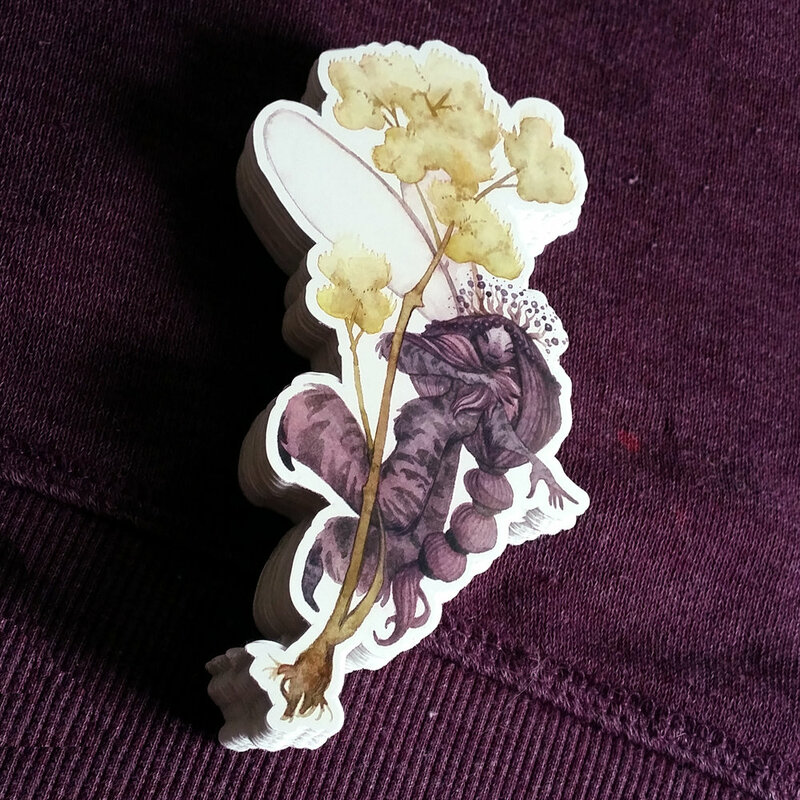 'Encounters with the Imaginary' Kickstarter book is now LIVE! I am so happy to share a new project with you! 'Encounters with the Imaginary vol. 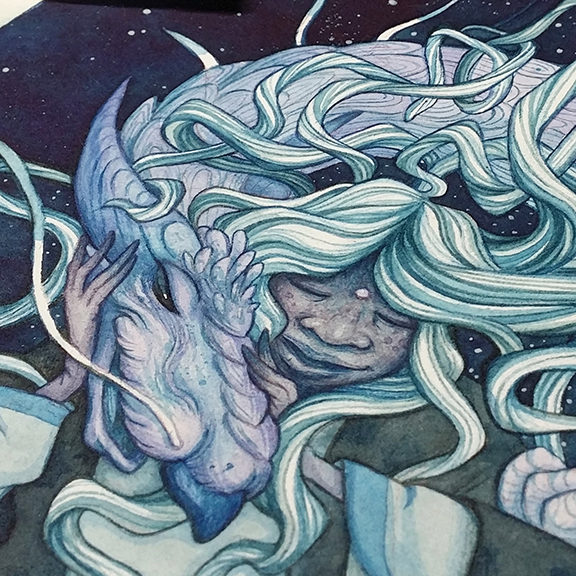 3' is an art book overflowing with fantastical creatures. This softcover anthology collects all-new artwork from nearly 45 skilled fantasy artists from around the globe. Each artist, including myself, wrote and illustrated a short story centered around an imaginary creature from mythology, folklore, or from an artist's original design! The Kickstarter goes live at 10 AM CST on Wednesday August 28th, 2018 and ends Friday September 28th at 8:00 AM MST! A couple of the illustrations I created for my short story, ‘The Diver’ that are appearing in the book. If you've been following my social media feed for awhile you know I've been battling with this painting for almost 10 months - and yet I didn't give up on it. The idea started with a sketch in my sketchbook that I wanted to expand to fit into a theme for an art book submission, 'Tiny Dragons' (which I never did get to submit). Once I started exploring the drawing, the further down the rabbit hole I fell. I went through so many iterations I made myself dizzy, but the most frustrating part, I would get super excited about where I was headed and then try to skip to the painting without completely working out the details. I work pretty fast compared to other artists. Granted, I do spend a lot of time exploring in my sketchbook so that by the time I'm ready to make a painting all the kinks are pretty much worked out - once I committ to painting, all that is left is what colors to choose and how I'll render the piece. From the time I sit down and transfer the drawing to the finished illustration, it can take 48-72 hours - tops. ...with the exception of this painting. I started this painting at the end of September 2017 and have been battling with it ever since. It should be noted that I have had a couple life events that have halted the painting process that couldn't be avoided - all 4 of my wisdom teeth were pulled, I had a major illustration assignment from Spider Magazine (10 painting due in 2 months) and the start of a new full time job at a sticker company. With every step, it was harder to get back into the groove that I had previously started, but I still wanted to keep going. I still felt there was something there. I started the painting over three times and ended up keeping the original I had started in September. Then suddenly it dawned on me to add the pentagram. I was toying around with other things when I came up the idea to add the pentagram cut-out shape. Working at a sticker shop has really made me aware of shapes and I wanted to add something that would push the story in my head further. Recently, I was invited to participate in Gallery 1988's 30th anniversary show, set to open April 6th, 2018 on Melrose in Los Angeles. The theme of the show will celebrating movies from the year that gave Gallery 1988 their name. I chose the movie 'Willow' not only because it was a childhood favorite of mine (and continues to be so), but also because I'm reminded of Brian Froud's fairies. I didn't make the connection till later in life, but the fairies that visit Willow and Elora Danan in the movie have the very same feel as Brian Froud's fairies in his illustrations. Whether or not this is the case, I have always been fascinated with portraying the magical. For the 30th anniversary show, I decide to illustrate the scene leading up to the presentation of Cherlindrea's wand to Willow, the precession of the fae as they make their way to Willow and Elora. The illustration is entitled, 'The Lally Maiden of the Forest' and is made with watercolor on paper. If you are in the Los Angeles area, you can visit the framed painting at Gallery 1998 until April 21st, 2018. Very excited to share a project I've been working on for Spider Magazine (Cricket Media)! It was a thrill to illustrate nine paintings plus a cover for a zine located inside the March 2018 issue of Spider Magazine. Detail zine cover with original painting. Detail of the fold out illustration in the magazine with the original painting. Today at noon EST, starts the first day of the Operation Gaia art auction hosted by the Changeling Artist Collective and The Bird Whisperer Project. Artists who were showcased on the Operation Gaia Tumblr during the January art prompt were invited to donate either the original or a hand embellished print into the auction. Proceeds raised during the auction will go towards the National Audubon Society. This year, I created artwork for the art prompt, "Night Owls". A limited edition hand-embellished print is up for bid at the Changeling Artist Collective Facebook page. Go to: https://tinyurl.com/operationgaia2 for more details about bidding. This is the second year of Operation Gaia. We were incredibly honored that the art community helped us raise over $4000 during our inaugural event. We look forward to another successful, inspiring year! Humbled and honored to have 'Sweet Little Echo' be accepted into the Infected by Art: Volume 6 annual! Congratulations to all the participants and selected artists!! I'm excited to announce that I have a feature in this month's issue of ImagineFX! The magazine hit newsstands in the UK September 8th, 2017, I'll let you know when I get a hold of my copy here in the States. Apparently our local bookstore doesn't carry the magazine (maybe my small town is a bit too small?) so we are heading up to the next largest town to pick up a copy once we can chisel sometime for a road trip. "Yavanna: Queen of the Earth, Giver of the Fruits", watercolor on paper. Yavanna has been a dear character to me since reading the Silmarillion for a class project almost 10 years ago. She is one of the Valor, a creator being of Middle Earth, in charge of the care of all things that grow. I've made several attempts already to illustrate her and this is the third. I have a feeling I will continue to illustrate her for years to come because to me she represents the wild creative. For her, anything is possible and that's a rather intimidating task as an artist. As I continue to grow artistically, so will my idea of her. 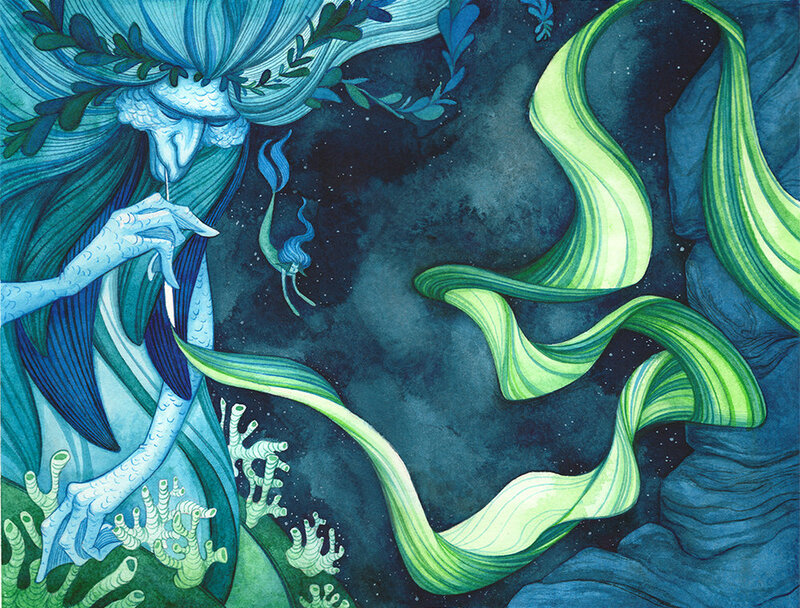 Yavanna is now up for bidding at this month's Changeling Artist Collective Auction! Please visit: http://tinyurl.com/thereandbackagain2 for more information! This last week has been spent working on a new painting. I always enjoy the process of painting, but since this has been one of the first that I've done in quite a while, I really sank my teeth into it. I was inspired by a drawing in my sketchbook I did during the hash-tag Mermay challenge. I jumped right into a color sketch and from there worked out my composition and tonal study. Once I was satisfied that I knew which direction I wanted to head, I went ahead sketched my under-drawing then went to work on building my watercolor layers. Stay tuned to see how the final illustration turned out! "Don't you want your heart eaten? ", asked the fire. It was definitely the fire that spoke. I just finished up reading "Howl's Moving Castle" by Diana Wynne Jones and played around with some color sketches of one of my favorite characters, Calcifer. Who's your favorite character? Happy Birthday Changeling Artist Collective! The Changeling Artist Collective turns ONE today! To celebrate they are having a giveaway. Simply head over to their page and comment on the item you would like to win. My limited-edition print, "There are no Strangers here" will be there along with other great work! For this month's Changeling's art auction held on Facebook, I created a little whimsical illustration entitled, "There are no strangers here". A vignette about companionship and the joyful art of conversation. The Changeling Artist Collective, 'Strange Brew' auction is now live! http://tinyurl.com/strangebrew-changeling Bidding ends March 17th, noon EDT. I have two painting's available for your bidding pleasure! 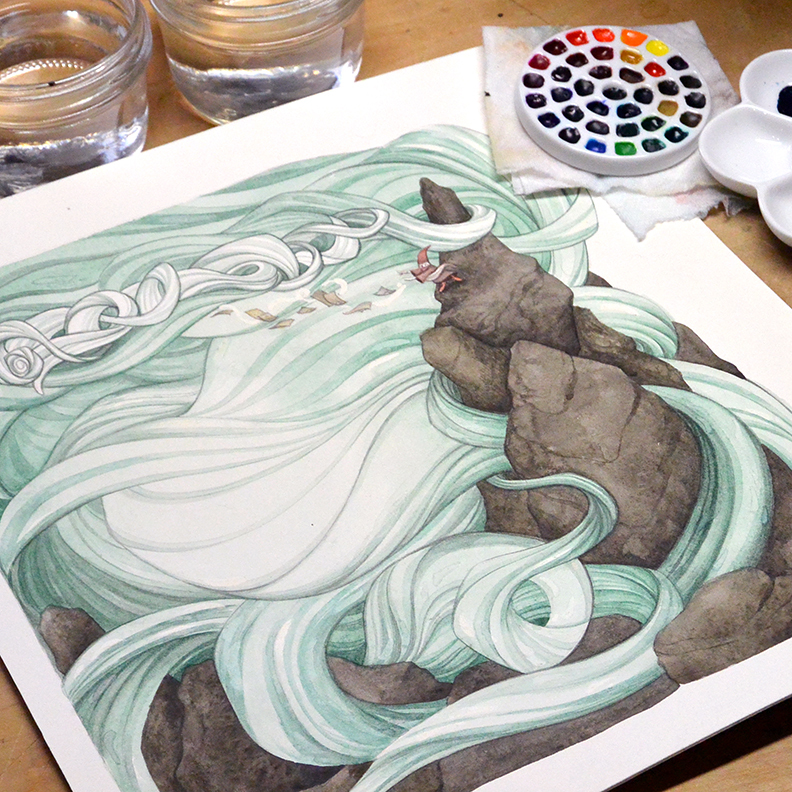 The following post is a little glimpse into my process for creating a watercolor painting. First I start off with my sketch. I usually don't get much more detailed than what you see here. I transfer my image onto watercolor paper using transfer paper. I usually have to erase up most of the transfer lines because they are too dark. The next step is to block in the color. My biggest weakness is making the blocked-in color too dark, so I'm very conscious of this step. I try to let there be some variations and let happy accidents happen as they may. I'd say for about as many happy accidents that happen, there are just as many un-happy accidents. The key is to try to make them look intentional. From here on out its just slowly adding details. And that's pretty much it. This watercolor painting is all ready for the Changeling Art Auction: 'Strange Brew'! Goodness gracious me, I've just hit 4,000 Instagram followers!! As a massive thank you to everyone in this wonderful community who follows and supports my work - I am having a PRINT GIVE-AWAY! The Thistle Queen started out with inspiration from nature. Cotey and I frequently take short hikes around our home and this day we wandered around Willow Lake in Prescott, AZ. I found a blooming thistle. What initially attracted me was the bees buzzing around it, but I was unable to capture them clearly with my camera phone. What I did capture, was a beautiful blooming thistle. A few days later I sketched out the Queen in my sketchbook. It took me a month or so to come back to the Thistle Queen. I wasn't ready to take her to color right away. A lot of times, I like to let things sit and sink in before I begin with the next step. Once I adjusted the image to fit the size of paper I wanted to use, I then transferred the image with transfer paper. Then I blocked in the colors using my watercolor paints. Next step, I start to add pencil on top of the watercolor. Using it as my darkest dark, use it to define the lines; also using a light gradient to enhance form. I alternated between pencil and watercolor till I get the desired effect. Once I feel its where I want it to be, I add metallic paint and its finished! 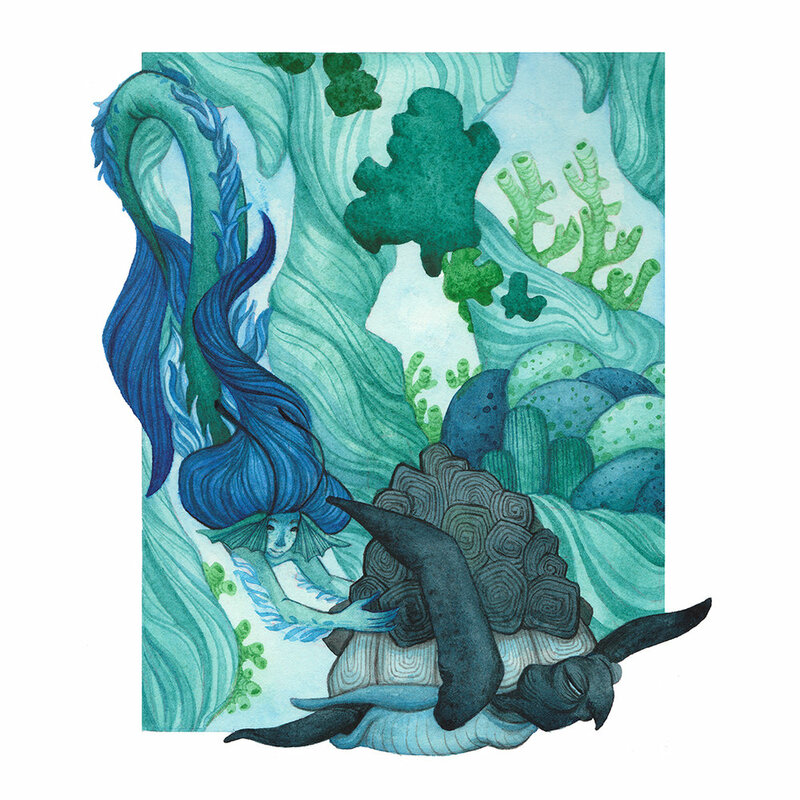 I wanted to illustrate a tribute to Joanna Newsom's latest album, "Divers", but I wasn't sure what I wanted to do. I've recently started using a sketchbook habitually, which I've been wanting to do for quite a while, but never actually took the time to do. That is where the illustration for "Swaying and Swooning" started. Below is the two illustrations that I had doodled without really thinking of a specific concept. Next I spent some time listening and thinking about her album which is where I came up with the final sketch. I tried a new method of digitally coloring the sketch in broad color tones. In the end, I felt that it didn't provide me with enough information. Next time, I think I'll try digitally doing a tonal study and then a tiny color study in gouache. I feel like I learn more about the color relationships when I can physically mix the color. It is also more satisfying to play with paints. In the end I feel the illustration was successful and I learned so much about my process. I'm anxious to start another painting to see if I can efficiently refine my method.